Former United States coach Jurgen Klinsmann lost his job as the manager of the men’s national team on Monday after five years in charge. The German used to be the golden boy of German, English and American football being a World Cup winner with Germany, a Premier League veteran and successful coach in America taking the national side into the last 16 in the 2014 World Cup. 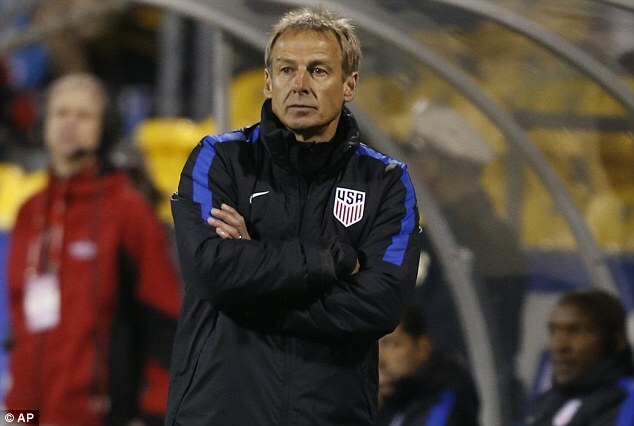 Klinsmann lost his job as the US record poor results in the 2018 World Cup qualifying campaign. The 4-0 loss to Costa Rica during the international break was the last straw that broke the camel’s back. The sharp decline would definitely make his profile not as impressive. Klinsmann used to be popular before and during the 2014 World Cup. He preached fitness and aggression, forcing US players to partake in a boot camp before their trip to Brazil for the World Cup finals. His insistence made him leave out star player Landon Donovan from the squad, as he did not reach the required level of stamina. They faced Germany, Portugal, and Ghana in the group stage yet they qualified, earning praises from all quarters. Tim Howard was the national hero even as they lost to Belgium in the knockout phase. Klinsmann did not build on the 2014 success and it came crashing down. His appointment was in the summer of 2011. He coached the team through 98 games, winning 56 percent and losing 16.3 percent. After the heights of the 2014 World Cup, US Soccer gave him a new four-year deal and the post of technical director but the urge to dictate affairs did not end well. The axing of popular Donovan and the way Klinsmann managed the situation caused tension in the players’ camp. The poor performances in the Hex forced his sack as the US place last. Three teams get auto qualification with the fourth slugging it out in a play-off. Bruce Arena has been called on to salvage the team.